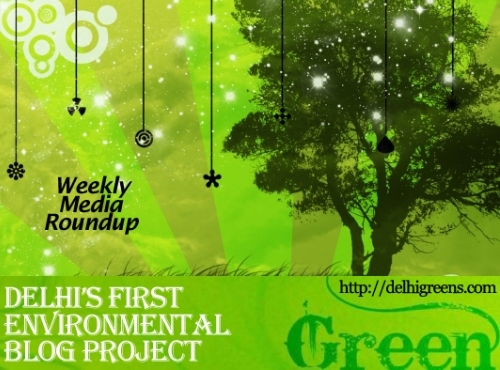 Weekly green news update from across different media networks for week 33 (between August 15 to 21) 2016. Delhi Minister of Environment and Forest Imran Hussain today inaugurated Van Mahotsav Plantation Drive at Mandoli Extension in Gokalpur Assembly Constituency. The New Delhi Municipal Council smart city project may be striving to make the area appear even more spick and span, but it may not integrate waste pickers in the clean-up process. THE DELHI High Court Wednesday issued a stay on an initiative of the New Delhi Municipal Council to demolish garbage dhalaos (collection points) in its jurisdiction as part of the “smart city” plan. Delhi Pollution Control Committee (DPCC) today claimed before Delhi High Court that a city hotel has been polluting the environment by discharging effluents into river Yamuna for the last two decades. The National Green Tribunal has directed the Delhi government and other agencies to prepare a comprehensive report on whether government buildings, bridges and flyovers have installed rain water harvesting systems and if they are functional. A plea alleging that reckless dumping of garbage and municipal solid waste near a school in East Delhi was causing health hazard to the children has prompted the National Green Tribunal to retrain authorities from throwing any waste in front of the school. Getting to know more about the Lodhi Garden and the flora and fauna in it will soon become that much easier. Following the Supreme Court order last week lifting the ban on diesel vehicles with engine capacity above 2,000 cc in Delhi, the Union government has opened a bank account where the mandated environment protection charge (EPC) can be deposited. Is India’s pollution spiraling out of control? The efforts by the Centre and Uttar Pradesh to clean the Ganga have borne “zero” result, the National Green Tribunal said today, as it pulled them up and sought reports on the discharge of industrial waste in the river between Haridwar and Kanpur. Innovation and technology adoption are required in various facets of sanitation, from cleaning of roads to management of waste, in order to make the Modi government’s flagship programme Swachh Bharat Mission a success, experts have said. The Delhi Metro Rail Corporation will apply for a no objection certificate from the Haryana State Pollution Control Board to run the food court in Huda City Centre Metro station on Monday. This will be the third time that the DMRC will apply for the certificate. Top officials of the forest department inspected the closed Bandhwari waste treatment plant and its adjoining forest area, following complaints by environmentalists and residents that leachate from the WTP and its landfill site in the Aravalis flows out continuously, which may soon pollute groundwater of South Delhi, Gurgaon and Faridabad.